An elliptical machine can look like something from an alien ship, but it is the perfect fitness machine for an exercise beginner. It is designed to be super easy to use and simple, even though it looks intimidating at first. When I saw an elliptical machine for the first time, I felt the same way. “How am I supposed to use that! ?”, I thought. I heard all about the low impact benefits you can get from this cardiovascular exercise machine, but I wasn’t sure how to use an elliptical, so I didn’t for a long time. When I finally got up the gumption to try it, I felt silly for waiting so long. Exercising on an elliptical machine is surprisingly easy, fun, but still useful. You can burn over two calories per pound of flesh on your body in just 30 minutes on the elliptical machine. Those are pretty good numbers! In this tutorial, I will share with you what I learned in my endeavor to learn how to use an elliptical and hopefully help you overcome your dread to try it too. Good shoes- make sure they are supportive and comfortable. Comfortable clothing with no loose material. Water or energy drink for hydration. 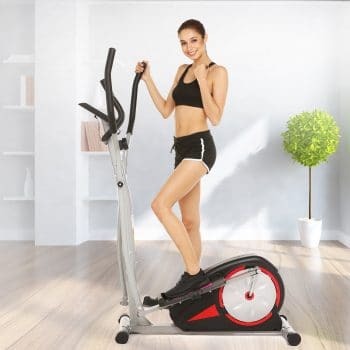 There are so many different models of the elliptical machine that it is essential that you understand the features and mode of use of your particular model. So ellipticals are cross trainers that include a stair stepper mode, but for this tutorial, we will be focusing on the primary type of elliptical that moves in strides of circular-ish motion. Take the time to push buttons, read all the different settings available and play around a little with the machine. This will ensure that you don’t get caught mid-workout with the desire to amp things up, or worse, slow it down for goodness sakes, and can’t figure out which button to push. You should know which buttons increase and decrease the speed, resistance and incline as well as how to turn it on, that should be a no-brainer. Elliptical machines can be tricky to mount. When you step on the pedals, they can move so be careful. The best way to do it is to hold onto the right handlebar, put your right foot on the right pedal and then grab the left handle as you swing your other leg over and place your left foot onto the left pedal. When both your feet are on the pedals, allow the brakes to balance out and gain your balance. Once you secure strong in your position, take a look at your feet. Make sure that they are in an even place on the pedals. Elliptical pedals are more significant than your feet so you can move them around to whatever position works best. You get the most grip and momentum when you place your foot closer to the front of the pedals. Some models turn on automatically as you start to pedal. Others have a quick start button that will turn on the machine. Check for a button that says “Quick Start” or pedal away! Before things get intense and you injure yourself, take the time to do a quick 5 minute warm up by pedaling at the slowest speed. Make sure that you include your arms by pushing and pulling the handles. The first time to complete an entire workout on an elliptical machine you should keep things simple. There are some preprogrammed workouts and the ability to change the incline and resistance for the pedals. Both of these changes will engage your leg muscles more. You may not be ready for this. Instead, focus on speed and getting in your cardio and proper form. Your first workout should be between 20-40 minutes with the bulk of the time being at a rate that makes it difficult to talk but not impossible. Your weight should be mostly on your heels, not on your toes which can be difficult because we are inclined to run toes first. On an elliptical, this can cut off circulation to our toes and putting your weight on your feet will make your legs and core work harder. During your workout, you need to make sure not to hunch over into the handrails. Your posture should be straight for the entire exercise. This is quickly done if you lean back slightly to curb your inclination to lean into the handlebars. When you get your fitness level up, you can begin to add resistance and incline and add in some different ways to use the elliptical, like pedaling backward. Many people don’t use the handles when using an elliptical, and that has its place, but by using the handles, you are not only working your lower body but also swinging your arms. This gives you a full body workout and will burn more calories. When you feel confident in your ability to complete an elliptical workout for 20 minutes at a reasonable speed, it’s time to switch things up so that your body continues to be challenged and you continue to lose weight. This is best done by trying different resistance levels and incline. It puts the pressure on your leg muscles, and you’ll start to see more definitions in your quads and calves. You can also try pedaling backward to work the glute muscles. You can also try interval training on the elliptical machine. This involves doing higher speeds or resistance for a period followed by a less difficult interval to recuperate and repeat the process until the workout is complete. This type of exercise is excellent to boost your metabolism and burns more calories than just doing longer workouts at consistent speeds. Another type of workout involves more balance and core muscles. This is done by dropping your arms and pedaling without handles. This makes you need to balance your body more, and this is done with your abdominals and back muscles. I hope you enjoyed this tutorial on how to use an elliptical. Anyone can do it, even people just starting to exercise. 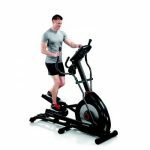 This machine is a great way to get in a great cardiovascular exercise without having to put excess stress on the joints. If you have any questions or concerns, please feel free to ask. If you know anyone who has recently purchased an elliptical or has expressed the desire to try one, please share this article with them to help them out.